When my kids were little they thought I was a “meanie mommy” for not letting them wear the kinds of pajamas their friends wore. Instead they slept in cotton long johns – albeit in cute colors. I wasn’t mean: I was preventing them from wearing jammies with flame retardant. Instinctively, a decade before research revealed that flame retardant materials didn’t protect kids from burns in house fires and that it was carcinogenic, I went organic. My kids have forgiven me, and Tris, the chemical that made kids PJ’s flame retardant, has long been removed from kids’ garments due to well-established biological safety hazards. But guess what, moms? Similar chemicals are packed into our sofas and tons of baby products — even nursing pillows! The average American baby is born with the highest recorded levels of flame-retardants amongst babies in the world! 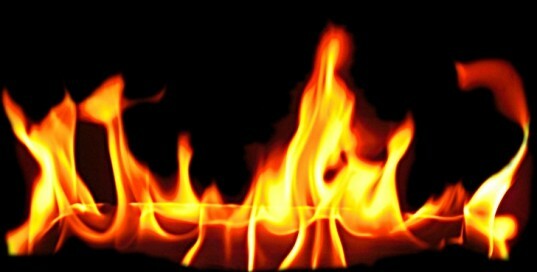 Flame-retardants are similar to PCBs, chemicals I have written about previously. They are linked to health problems ranging from lower IQ to diabesity. Penta, a chemical that was previously packed into couches and other furniture, turned up in the blood of babies and in breast milk around the world. The European Union banned it after researchers linked it to developmental and neurological problems in children, and manufacturers pulled it from the market. “Safer” chemicals were supposedly created as alternatives in the US but it turns out that “Firemaster 550” and others were just as dangerous as their older cousins. According to Kristof, Big Chemical and Big Tobacco are in on this one, hand in hand. There’s a lot of smoke and mirrors behind the data. Our kids get the biggest household exposures! One researcher found that a fifth of the nursing pillows, car seats, highchairs, diaper-changing pads and other products made with polyurethane foam contained the “alternative.” And the most common flame retardant detected in baby products? Chlorinated Tris! The very stuff taken out of pajamas wasn’t banned from commerce; it just migrated into other kid products! Why do our babies and toddlers get such high exposures? Dust containing the chemicals gets onto our floors, and our little ones are exposed through breathing it in and ingestion when they play on the floor. Let’s be “meanie mommies” and get this stuff out of our environment once and for all! Wash your baby’s or toddler’s hands regularly and before they eat; Reguarly rinse toys that have been on the floor that will end up in their mouths. If you have wood floors, damp mop regularly to remove as much chemical dust as possible; if you don’t have wood floors and can afford to, switch to wood flooring. GO GREEN: Use your purchasing power to demand products free of hazardous chemicals and don’t use baby paraphernalia you don’t need. If you are just furnishing your home, decorate with wood and consider futons made of organic cotton materials rather than foam for your chairs, sofas, and bedding. Avoid upholstered furniture and carpet padding made with polyurethane foam. 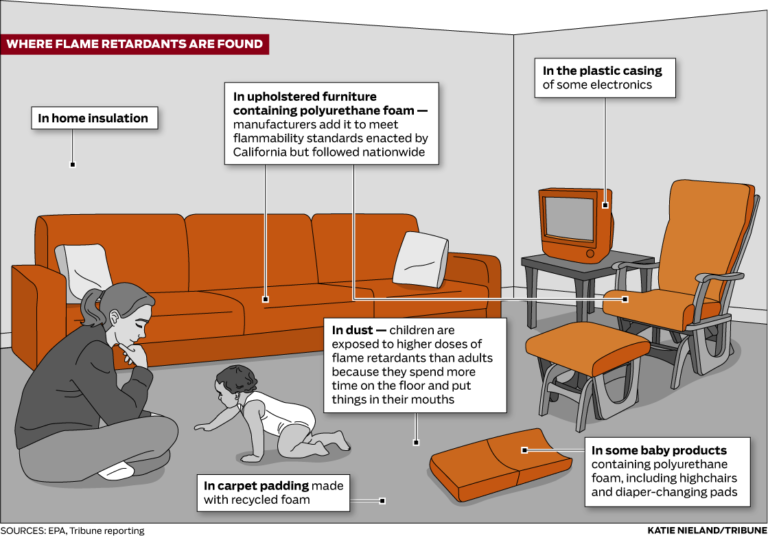 This excellent illustration appeared online in The Chicago Tribune which has a thorough investigative report on flame retardants in the environment. Hi Gretchen Super good question. A wool mattress pad (or 2) can add some softness. And if you must go with the foam, put something between you and it and the sheet. A wool mattress pad would work for that, too. Also, consider checking in with your local futon store. Many towns have them. They might know how to source something more natural for you that would give you the softness and the safety! Please let us know what you find out! After much research we just bought our toddler's bed from nestbedding.com They were the most affordable that we found. I saw a blog post somewhere recently about DIY buckwheat mattress kits. I have been trying to replace the foam furniture in my home and have been having a tough time finding an alternative I can afford. I haven't made my own mattress yet, but I thought I'd throw that out there. So if you let things like an mattress or carseat air out does that help? Same with a nursing pillow? Also do the chemicals reduce after time? Can you please advise which baby pajamas contain fire retardants? I called Carters and they reassured me that they do not add any FR to their pajamas? Please advise. Any thoughts on leather couches? I have been mulling with the idea and I wonder if the leather would serve to contain the foam dust, my husband will never go for a futon, at 6'4 and 300 lbs it has taken 3 years to find a couch that doesn't feel flimsy to him to replace the iron frame, hard as a rock, so grimy its grey and not cream 50's one that came with the house. We had a leather sofa when our kids were growing up (and a futon one, too). I think they are a great bet! I have the same problem. I wanted to reupholster my old leather couches however the quote I received to make them with the latex foam simply shocked me. It was something about $10.000 for two couches. Do you have any other ideas for the filling/cushions that is healthy/fire retardants free and not expensive? If I go with leather couches with Polyurethane foam will the leather keep the chemicals away from us? When do the fire retardants dust start to migrate out of the couch? thank you. Great post! Been reading a lot about exposure to chemicals in these kinds of things. Thanks for the info here! Hi Kailey! Check the Environmental Working Group for resources -- or consider an organic cotton crib futon. Hello Aviva, You've been a hero of mine for a long time! Anyways, do you think a "strip" would get rid of the retardant in pajamas? Borax, calgon, and washing soda? Makes me consider my daughter's car seat, too. Pretty sure they're flame retardant... And referring to foam mattress pad, when you say put something between you and the sheet, do you mean another sheet? Would a cotton mattress pad work? Thank you! Hi, any suggestions for what to use as a waterproof fitted sheet under the normal cotton fitted sheet for kids beds? My kids very rarely have an accident, so probably don't need it, but I would hate for their mattress to get ruined if they did.